The fourth appetizer we have for our Super Bowl Healthy Eats Series is this one for Spring Rolls with Green Garlic Soy Dipping Sauce. 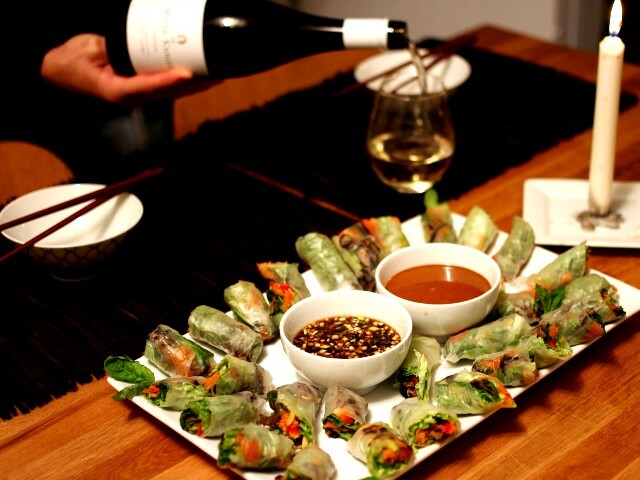 We love making spring rolls as a healthy appetizer. As well they are great for a light meal. Spring rolls are like a salad burrito – everything you should be eating in a nice tidy roll up. Sometimes we will grill meat or seafood and roll that up with all the crisp veggies. This time we grilled some eggplant as well as portobello mushrooms that were lightly seasoned with a little sesame oil and salt. I normally make a dipping sauce that uses fish sauce but we wanted to keep within our vegetarian diet so I made this soy-based sauce with some green garlic that I picked up at the market last weekend. As well we cheated a bit and served a store bought peanut sauce but if you would like to make one check out Maria’s recipe, it sounds and looks amazing! Put everything in a small bowl and whisk or put everything in a small jar with a lid (as we do) and shake. Heat a stovetop grill pan and drizzle a bit of sesame oil in it. Add the mushrooms and eggplant, in batches, and cook until soft. Set aside. Have a bowl full of hot water, it will cool down as it sits, nearby. One at a time dip a rice sheet into it, for not more than 3 – 4 seconds. Lay the rice sheet on a cutting board or a work surface. Place a small amount of a lettuce leave on the rice paper, then your vegetables and a few herbs on the near side of the rice sheet, closest to you. Do not over pack the sheet or it will not roll. 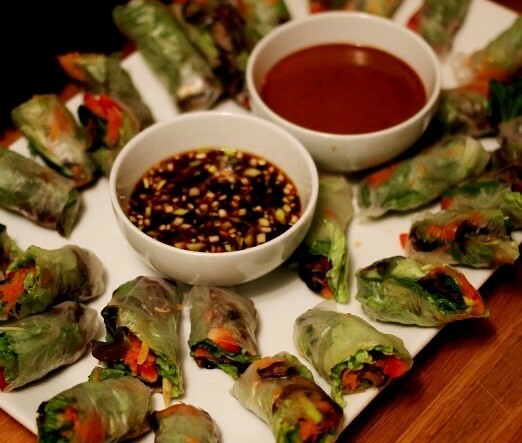 Start rolling away from you, gently pulling a bit of the rice paper over the veggies – roll, tuck in the sides, roll, tuck in the sides. Continue making rolls until you have used all of your ingredients. Cut each roll in half and plate. 4 Responses to "Spring Rolls with Green Garlic Soy Dipping Sauce"
Thanks for the shout out:) I love that big platter of spring rolls. I wish I could dig right in!